Even later Chevrolet changed to the Michelin Pilot Sport PS2 ZP. I used Eagles for years but eventually switch to Pilot Sports. As part of the Ron Fellows package my Z06 came with RPO Q76 chrome aluminum wheels. In 2014 I picked up an extra set of wheels from a a guy on the Corvette Forum. 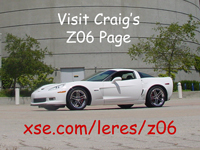 He had taken them off his 2008 Z06 after only 2000 miles to install aftermarket wheels. This was an awesome score considering that new wheels about about $800/each from the dealer. And since they are chromed they are also expensive to repair. The year and month of manufacture are molded into the top of the sensor with little dials. Each has a ring of numbers and an arrow in the center that points to the year or month. My Z06 came with aluminum Schrader caps and I ordered a box of caps so I could keep OEM appearance when caps are lost or damaged. TPMS sensors use a lithium battery and have a lifetime of about ten years depending on miles. The sensors transmit information every 60 minutes while sleeping and every 60 seconds when turned on. They turn on above 20 MPH and sleep after 20 minutes below that speed. There is one TPMS antenna per sensor located near each wheel. I replaced my sensors after about 11 years when I was installing new tires. First I orderd the GM parts from Amazon but I sent them back because the date codes ranged from 3 to 5 years old. Also, the GM parts do not come with new nuts so I returned them. I end up buying Schrader sensors from Tire Rack. They also had a large range of date codes but the boxes all had 2017 dates. My orignal sensors were all dated December, 2007 except for one dated July 2007. This is four months after my car was built but I had a sensor fail and it was replaced under warranty. In the case of my Z06, the battery is a Renata CR2450NFV-LF and some folks have removed the potting material and replaced batteries. I have both the OTC 3833 and Cub Pro-101 TPMS scan tools. I bought the OTC because it is made by the company that makes the factory scan tool Kent-Moore J-46079. It uses C cells and is really hard on batteries. The Cub came from Tire Rack for $19.99 and was a special deal they ran back in 2014. It's firmware can't be updated but works great for the years and models it supports. It uses AA cells and is also hard on them. It shows the sensor ID and the temperature if the sensor supports this (mine sensors do not). It seems to wake up sensors more quickly than th OTC so it's what I usually use. Sensors can also be woken with a low frequency signal TPMS tools generate. Data is transmitted on 315 MHz. Important: Before proceeding with the procedure below, ensure that no other learn procedure is being performed simultaneously. Select the ACC position on the ignition switch. Simultaneously press the keyless entry transmitter lock and unlock buttons until a horn chirp sounds, indicating the TPM learn mode has been enabled. Starting with the left front tire, hold the antenna of the J46079 against the tire sidewall close to the wheel rim at the valve stem location then press and release the Activate button and wait for a horn chirp. After the left rear sensor is learned, a double horn chirp will sound indicating all sensor IDs have been learned. Select the OFF position on the ignition switch to exit the TPM learn mode.